For those of you just embarking on your curly hair journey, be patient! It took me years to learn which hair products, brands, and ingredients really worked for me and which didn’t. I’ve finally whittled my curly hair products down to a little set of ride-or-dies that work really well for me. 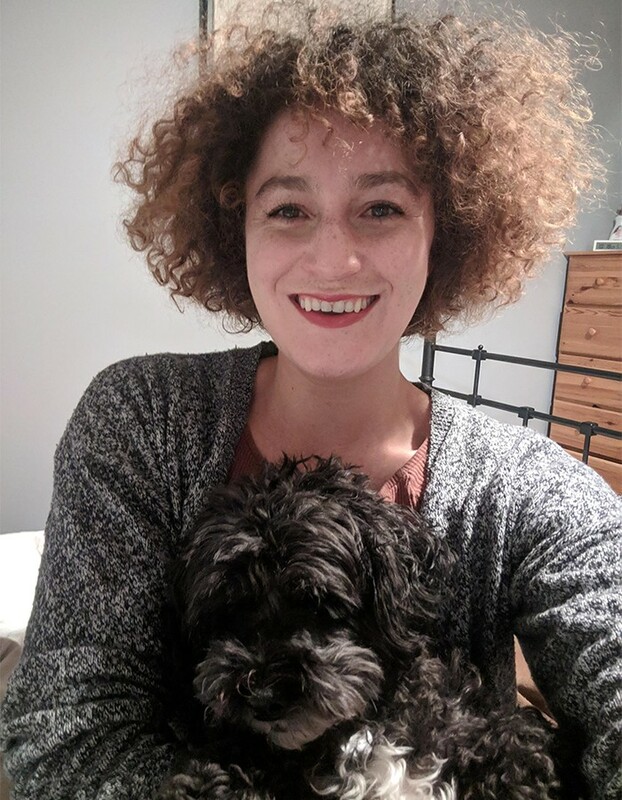 Over the years, I’ve learned that my hair really thrives when I use products that are silicone-free and have nice, short, natural ingredients lists. Whenever I have the time, I deep condition my hair before I wash it for a few hours or even overnight. I sometimes use coconut oil because of its proven ability to actually penetrate the hair shaft. But now, hair experts now advise those with low porosity hair to avoid coconut oil. I’ve been turning towards all natural shea butter instead, which I buy from none other than SheaMoisture. A few years ago, I discovered Qhemet Biologics and I’ve been in love ever since. This is my go-to post-shampoo leave-in conditioner brand. First thing out of the shower, I smoothe a healthy dollop of their Burdock Root Butter Cream through my hair and give it a few minutes to sink in. I’m on my fourth pot of this product and I’ve never before been so satisfied with a leave-in condition that I’ve repurchased. Recently, I grabbed their heavier Amla & Olive Heavy Cream to add a bit of extra moisture in persistent genetic problem spots in my hair. I up my leave-in conditioning with some oils afterwards. I mix Qhemet Biologics’ Castor & Moringa Softening Serum with Shea Moisture’s 100% Pure Shea Oil. I’m a fan of minimal styling. My hair doesn’t feel my own if it isn’t a bit wild, a bit frizzy, and really big. I love it when my curls feel full and poofy and voluptuous, and hate it when they feel crispy and stringly. I use Uncle Funky’s Daughter’s Curly Magic in my hair. It has a really slick, slippery texture and leaves just the right amount of hold. For me, blow drying with a diffuser is a must. I even have a small travel blow dryer with diffuser, and a silicone foldable diffuser attachment, so that no matter my travel situation, I have a diffuser of some sort with me. I’m not very picky about the blow dryer itself. I use the Jinri 1875W Ionic Infrared Blow Dryer. I start off at a high heat setting with low speed and scrunch my hair using the diffuser prongs. I then turn up the speed and blow at my hair, manually scrunching my hair as I move the blow dryer around my head. 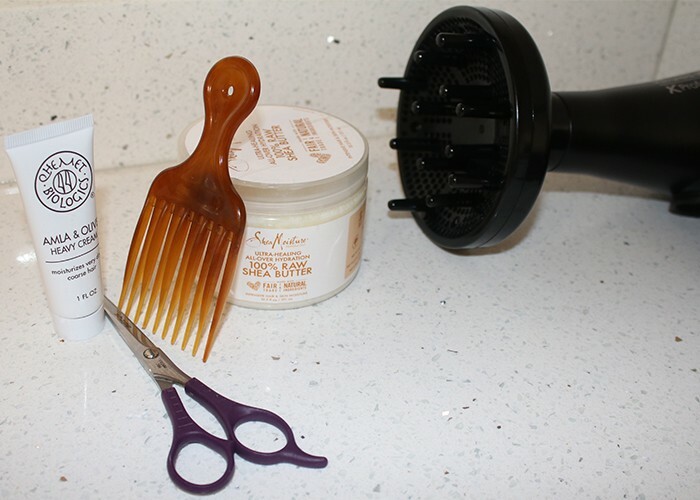 Using an afro pick has become an important part of my styling routine. But I never pick just after I’ve washer and dried my hair. My mixed race, thick hair will still take a few hours to dry completely at the roots even after I’ve blow dried, and I never want to over blow dry my hair. Later that day or the next day, I’ll turn my head over and pick my hair just at the roots to up my root volume. I’ve been pruning my own hair for years using a pair of shaping scissors I bought from Ulta. Anyone who sews knows that you have to make sure your scissors are single purpose or they’ll dull way faster, so I’ve only ever used these on my hair (I’m definitely due for a replacement!). I prune my hair very gingerly whenever I feel it’s necessary, cutting lock by lock and only under a half inch at a time. I try to take into account that after I wash and dry my hair again, any strand that I cut will end up shorter than I could have anticipated since it will curl more without the added weight. I go a week, sometimes two, between washing my hair. Towards the end of that week, my afro pick becomes very important for re-shaping the silhouette of my hair and lightly teasing out some knots. I’ll also use the Amla & Olive Oil Heavy Cream to smooth over any curls that have come undone, and then finger twist them and let them dry so that they re-curl. What’s on your curly hair top shelf? Do you gravitate to tried, tested, and true products or are you hooked on a new find? Share with us in the comments!